Employment disputes most commonly occurs when there is some disagreement between an employer and one or more employees. Employment disputes can be incredibly sensitive matters since professional reputations and business ties are often at stake. These disputes can also be precarious as employment and family income may be dependent upon the verdict. At other times, a company’s reputation or brand image might be under scrutiny at the time of conflict. In any case, our Chicago commercial litigation attorneys provide legal representation to employers and employees alike so that the legal rights and liberties of all persons in the workplace are equally defended. Some matters that may spark employment disputes include, but are not limited to: hours and wage rights, employee benefits, working conditions, health and safety codes, employment benefits, harassment in the workplace, demotion and termination. Another common area of dispute is employer-employee contracts and the include terms of agreement. Some clients may wish to challenge or amend the provisions of an existing contract, while other clients may be seeking legal counsel to draft a new contract all together. Employment disputes could also overlap with breach of contract disputes if an employee, employer, or company believe that the terms of an employment contract have been violated. 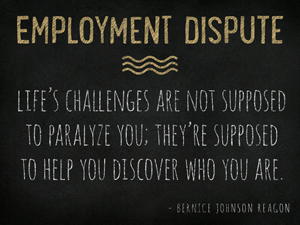 The two most common options for employment disputes are arbitration and litigation. Arbitration allows a third intermediary party to examine the cases of both sides and make a verdict to resolve the matter. While arbitration is often less expensive than litigation, the decision in arbitration will usually be binding. The litigation process on the other hand provides a more transparent option and can be challenged in an appeals court at a later date, if necessary. Mediation, negotiation, and Employment court may also be options worth exploring for some clients. Our Chicago business dispute attorneys assess the needs of our clients on an individual basis and then help them select the resolution option for their needs.